A traditional diamond patterned, glossy wood top rests upon stretchered metal table bases for a traditional twist on the industrial vibe in the Hallbrooke end table. 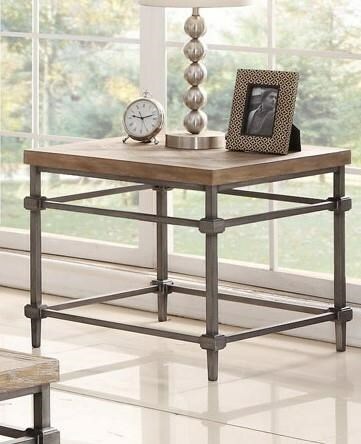 A light ash finish contrasts the gunmetal bases to create a hardworking end table that is substantial and simple in any seating venue. Urban lofts as well as Pacific coast getaways and downtown condos welcome the geometry and style of Hallbrooke. The Hallbrooke End Table by Home Insights at Great American Home Store in the Memphis, TN, Southaven, MS area. Product availability may vary. Contact us for the most current availability on this product.